This isn't just a black blazer. 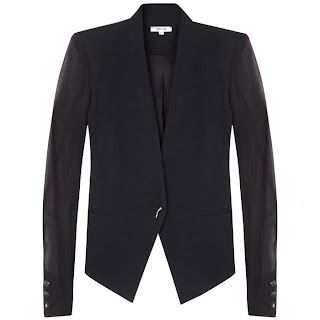 It's a blazer that is beautifully structured, sleek and collarless but the thing I loved most were the sheer sleeves. Structured blazer I have and collarless blazer I have as well but sheer sleeves I do not and I'm drooling over this, I need it so bad!!! Since this one in particular comes with a hefty price tag I will be on a major hunt to find one similar that will suffice. I stumbled upon this masterpiece when I came across the style of Annabelle Fleur (images below). What a stunner with flawless style and who obviously rocks this blazer as if it was made for her. Please dear blazer find your way to my closet. hadoop training in noida -Webtrackker is one of the best-rated Hadoop Training Institute in Noida, offering the best experimental practice knowledge of Hadoop training at Noida. In Webtrackker Hadoop training is conducted with 6+ years of experience in real-time project management. Hadoop is the baby poster for Big Data, so much so that the open source data platform has become virtually synonymous with the very popular term for mass storage and analysis of information sets. If you are search training center in noida for hadoop than Webtrackker is the best hadoop training in noida. Hadoop also allows companies to store data, such as structured or unstructured, so you do not need money and time to configure data for relational databases and their rigs. Since Hadoop resizing is so easy, it can also be the perfect platform to capture all data simultaneously from multiple sources. Hadoop's cheaper advantage is the ability to save much cheaper data than RDBMS software. But this is just the first part of the story. The ability to get as many low cost data to capture and maintain, means that companies can use their data to make more down-to-earth decisions. This kind of cost savings means that Hadoop companies offer the ability to keep all their data, not only the measured part. Fixed assumptions may not be in advance. All the data are the same and equally available, so that business scenarios can be run at any time, with raw data, without restrictions or hiring. This is a big problem, because if there are no data to be discarded, each data model that is to try a business, it is a fair game. This scenario is the next step in using Hadoop, Doug Cutting said, Chief Architect of Cloudier Hadoop and one of the first pioneers.